Having heard a bit about Cage Cricket whilst in Epsom Godfrey was keen to see what it was all about. Therefore, on 10 July he came along to a couple of sessions. At the Longmead Centre in Epsom, Godfrey witnessed the Over 50’s session and then gave a quick batting masterclass. From there, it was on to Coombe Girls School where the players were very excited to meet a professional player. 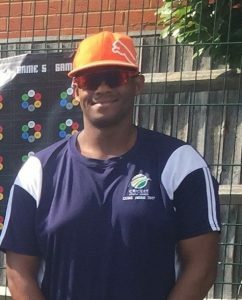 Godfrey was very impressed with both sessions and said of Cage Cricket “I would really like to take this to the young people at my Academy. I like the way it is simple and keeps everyone involved”.